Like messages that come from minds long dead. View Harold's more than 1000 songs at : Click here. HAROLD ADAMSON & ELIZABETH TAYLOR Click: here. Our Pal Hal: An Affair to Remember a documentary on Harold Adamson's life as a song writer was produced in 2003 by myself, Hal's nephew for Public Access T.V. in NYC, Brooklyn, Los Angeles and other TV stations. For a copy of a 45 minute Our Pal Hal video shown in New York and other Public Access TV Stations around US. Send $13.00 to t he P.O. Box shown above. Can not tell you how many times I have walked by Grant's home. Home to right was Marion Davies home, that she rented to Cary Grant when he was acting in the film An Affair to Remember. I do not receive any royalities from Harold's songs, yet am happy to have had the time with him as a kid, not realizing then how talented he was. Aunt Gretchen was always having our family over for the holiday season and taking a special interest in me. Fond memories is worth it's weight in gold. Uncle Hal wrote the songs for film, father Douglas Adamson was selling Marion Davies a 10-acre ranch in Palm Springs after she married Horace Brown in the mid 1950s. The film Institute voted the film the fifth most romantic film of all time. I wish I had a dollar every time I have walked or ran by Davies' home when I lived in Santa Monica. Nine years later our housekeeper Irene Boyd Barrett (who worked for creator of Charlies Angeles Ivan Goff), gave up a job to work for Dyan Canon and Grant to take care of the Adamson kids at 352 18th Street. One can view some of Harold film songs on Turner Classic Movies TCM, on Dec. 19, 2017 they had Jupiter's Darling, 1955. For a complete list of Harold Adamson's songs from movies, click here. For other hit songs, click here. Harold Adamson--Accepted into the Songwriters Hall of Fame in 1972; and through his career had Five Academy Award Nominations 1: Film Suzy 1936; "Did Anyone Ever Tell You" sung by Jean Harlow and Cary Grant (Rare Cary Grant sings Hal's song); 2). Film That Certain Age, sung by Deanna Durbin; "My Own" 3). 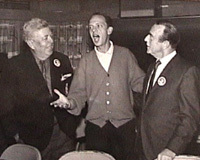 Film Higher and Higher; "I Couldn't Sleep A Wink Last Night" Sinatra's first Oscar nomination; Victor Borge and Mel Torme make film debute singing Hal's songs 4). Film Hit Parade of 1943; "A Change of Heart." 5). Film An Affair to Reemember song sung by Deborah Kerr and Vic Domone. Interesting Oscar history is that Luise Rainer who won an Oscar in film The Great Zigfield is still alive at age 102. That is a record. Also David Niven made history when he won an Oscar for Separate Tables for the shortest film time 15 minutes. That too is a record. For Harold Adamson's longest songwriting partner Jimmy McHugh's song list click here. Harold Adamson would probably have preferred acting in motion pictures to writing songs for them. Although he experimented with verse writing while in prep school, his ambition was to become a thespian. While a student at the University of Kansas, he gained experience on the boards by performing in summer stock. On transferring to Harvard University, he landed roles in the Hasty Pudding Club Shows. Harold may have been inspired a little by his uncle Ernest Martin chief camera engineer at Vitaphone and Vitagraph. Mr. Martin was the electrical engineer for many Rudolph Valentino movies. In 1926 Martin set up the electrical work for the very first sound movie Don Juan staring John Barrymore.To hear Vic Damone sing An Affair to Remember. Was it merely coincidence that Deborah Kerr and Hal's mother "Minnie" Campbell were born in Helensborough, Scotland? Something tells me no. This film was voted the fifth most romantic film of all time. Ten years later, Harold would write songs for two movies staring Lionel and John Barrymore. Like many artists who trained for other careers, Adamson's plans were changed by the unexpected success of a song. Adamson clan. Circa 1910, Harold Adamson makes FILM DEBUTE in baby buggie. 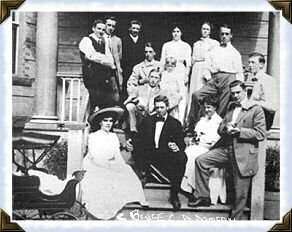 Minnie and Jim Adamson up front; Minnie sister in backrow; Ernest Martin is on the right with hand in pocket, his wife Flo Adamson is holding dog; James Adamson, Sr. is in back and wife on other side of sister Campbell; Percy inventor of "Lastex" is backrow with young boy; In front of Percy is Tom Adamson; . In Adamson's case, the composition was "Time On My Hands" for which he wrote the lyrics in conjunction with Mack Gordon. Adamson was barely out of college when the song was introduced in Florenz Ziegfeld's Broadway production Smiles in 1930. That same year, his work was heard in Earl Carroll's Vanities. After three more stage musicals, the 27-year-old lyricist was lured to the cinema capital by an offer from Metro-Goldwyn-Mayer. Bruce Adamson has written and produced an 58 minute documentary on Hal's career. Narratored by Wes Sims of Channel 46 Monterey B ay. 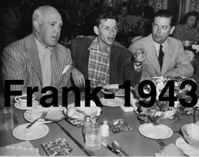 Photograph of Jimmy McHugh, Frank Sinatra and Harold signed by Sinatra "Bruce, All the Best. Frank Sinatra 1989." Taken at the time Sinatra won his First Academy Award nomination by McHugh and Hal's song I Couldn't Sleep A Wink Last Night. 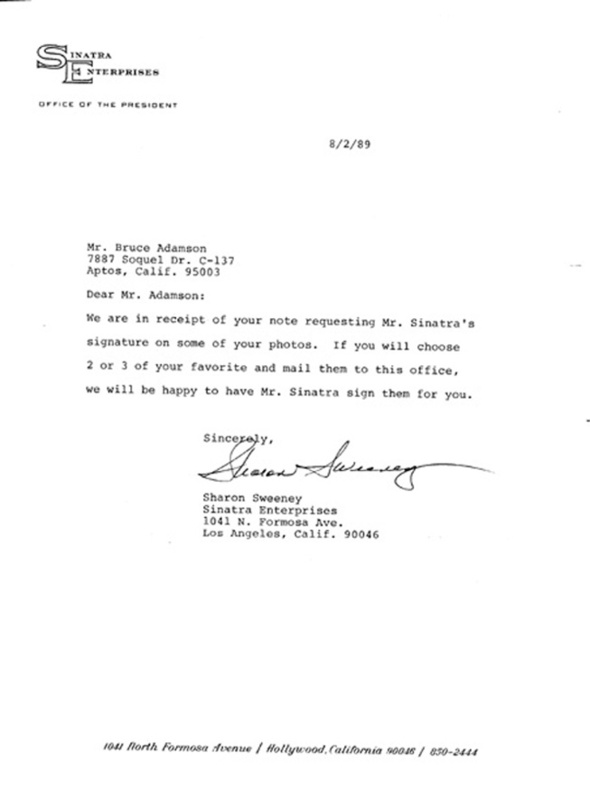 Click Here for Sinatra Letter 1989. One of the most popular stars under contract to MGM was Joan Crawford. Harold Adamson's first assignment for the studio was Crawford's Dancing Lady (1933) co-starring Clark Gable. 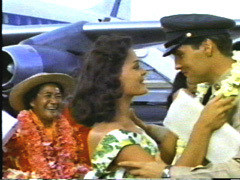 The film's score included numbers by other lyricists, but it was Adamson's "Everything I have Is Yours" that audiences remembered. The next year, he worked on Fox's Bottoms Up starring Spencer Tracy; on RKO's Strictly Dynamite, in which Lupe Velez and Jimmy Durante appeared; and, working on loan to United Artists, on the Eddie Cantor vehicle Kid Millions. Billie Holliday sung Hal's song from his first film from You Tube. The first of Adamson's songs to place on the new radio program called "Your Hit Parade" was "Everything's Been Done Before" sung by Jean Harlow in the 1935 movie Reckless. Harlow also introduced "Did I Remember" which was nominated for the Academy Award in 1936 in the film Suzy. In this movie one will catch a very rare glimpse of Cary Grant singing Harold's song. Just before production started, studio head Louis B. Mayer gave Jean Harlow a $5,000 bonus, primarily in recognition of the surprising profits on her previous film, Suzy (1936), which had brought in three times its cost. Harold and Walter Donaldson had collaborated on the song "You" Which was in Harlow's second to last film Libeled Lady. I believe her last song sung for the film industry "You." Tidbit Lionel Barrymore was replaced in film. Libeled Lady was nominated for Best Picture.yet Harold's other film "The Great Zigfield" won the Oscar for best film. After a dozen films at MGM, Adamson signed with Universal, where he supplied Alice Faye and Deanna Durbin with two more "Hit Parade" favorites-- "You're a Sweetheart" and "My Own", which brought the lyricist his second bid for the Oscar in 1938. Marilyn Monroe worshiped Jean Harlow. Hal wrote several of Harlow's last songs while she walked this earth. Harlow was the godmother of the daughter of Bugsy Siegel. Bugsy is noted as being the founder of Las Vegas. Hal was hired by Howard Hughes' to write two songs for The Las Vegas Story. It was Hughes who produced Jean Harlow's first film in 1930 Hells Angels. Clark Gable who was in Hal's first film was the leading man in Monroe and Harlow's last films. Harold wrote Jean Harlow's last film songs and it was Harlow who was the inspiration to Marilyn Monroe. Click here for Jean Harlow Photograph autographed. During the years of World War II, Adamson's film songs "I Couldn't Sleep a Wink Last Night," "A Lovely Way To Spend an Evening," "Daybreak," "How Blue the Night," and "I Don't Care Who Knows It" all made the weekly surveys of America's ten top tunes. Harold wrote the lyrics to Hilo Hattie in the early 1940s. 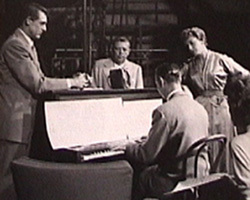 Hal competed in the annual Oscar derbys for the third and the fourth times when "Change of Heart" (from Hit Parade of 1943) and "I Couldn't Sleep a Wink Last Night" (From Higher and Higher) were in the running. This song was Frank Sinatra's first Academy Award nominating song. In WWII Hal was given awards from the Department of War, for writing patriotic songs for movies and hits such as "Coming in on a Wing and a Prayer" and Bing Crosby's "Buy a Bond". Hal wrote the song "There's A New Flag on Ima Jima." Adamson's success continued after the war and he provided lyrics for Susan Hayward in Smash-Up (1947), Jane Powell, Carmen Miranda and Elizabeth Taylor in A Date with Judy (1948), Hal wrote songs for four films that Carmen Miranda appeared in. Its a Most Unusual Day when Carmen sings one of Hal's song. Would you like to hear Marilyn Monroe sing? She sang Hal's song "When Love Goes Wrong, Nothing Goes Right." Hal teamed up with Hoagy Carmichael to write for Jane Russell and Marilyn Monroe the above title and Ain't Anyone Here for Love. See trailer at You Tube. Jane Russell in His Kind of Woman (1951), Jane Russell and Marilyn Monroe in Gen tlemen Prefer Blondes (1953). ** In 1956, he added words to Victor Young's main theme from Around the World in 80 Days, and it became the eighth of his inventions to top "Your Hit Parade." Victor Young had received 22 Oscar nominations before winning an Oscar for Around the World in 80 Days, six months after Young had died. Harold could not be nominated because he wrote the lyrics two weeks before Oscar night. In 1957 Adamson received his fifth Oscar nomination for writing the lyrics with Leo McCarey to An Affair To Remember. Adamson however, his most prolific piece of work is the lyrics for the theme song to "I Love Lucy". To see the video clip of Harold most famous song Harold Adamson's I Love Lucy on You Tube. Harold Adamson was born in Greenville, New Jersey, in 1906 and was 73 at the time of his death in 1980.. When Hal Adamson died 37 years ago on August 17, 1980 at the service Johnny Green played the piano at the Church in Beverly Hills. Green had nine Oscar nominations and won three Oscars. Green is remembered for his great music and conducting in the film "West Side Story." Other great films Green worked as the musican conductor was Bye Bye Birdie and Oliver. Green won 5 Oscars , examples Oliver and West Side Story. I remember shaking hands with Green and Merton Berle. Met our cousin Meg Foster. Hal and Johnny Green had worked together during World War II in the film "Bathing Beauty," with Esther Williams and Red Skelton. 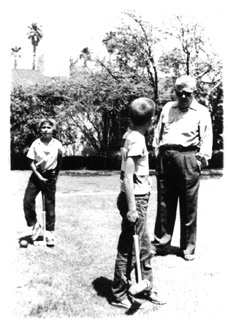 An Affair to Remember, Bruce playing with sister in Harold's backyard at 704 North Alpine, Beverly Hills in 1959, Hal looking on. Not far away a few blocks Frank Sinatra had a home. Next door was Donna Reed, both Reed and Sinatra won Oscars in 1953 about seven years earlier, for From Here to Eternity. Rings a bell with Hal. In the summer of 1981-82 my aunt Gretchen went on vacation and allowed me to house sit for three months. Everyday was a hot summer day and I would jog all around the bordering parks in Beverly Hills. One of the days Sean Penn and Timothy Hutton came over. 21 years after the photo to the left was taken. Eve Adamson -- Harold's daughter died at age 68 on Oct. 8th, 2006. Tennesse Williams said of Eve "She directed the best version of Cat on A Hot Tin Roof he had ever seen," on stage. 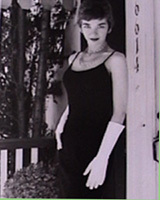 For an extensive biography of Eve Adamson Playbill obituary (Photo Tennessee Williams click here. For Eve Adamson's New York Times obituary click here. On Feb. 11, 2006 Harold Adamson was honored at the Kennedy Center (Washington D.C.) in honor of Hal's 100th year of his birth. I came in through the backdoor. Eve, my cousin, Harold's daughter said it was a great event. I could not afford the trip, but was pleased I was given credit for producing the Our Pal Hal video twice by Mr. Reed. 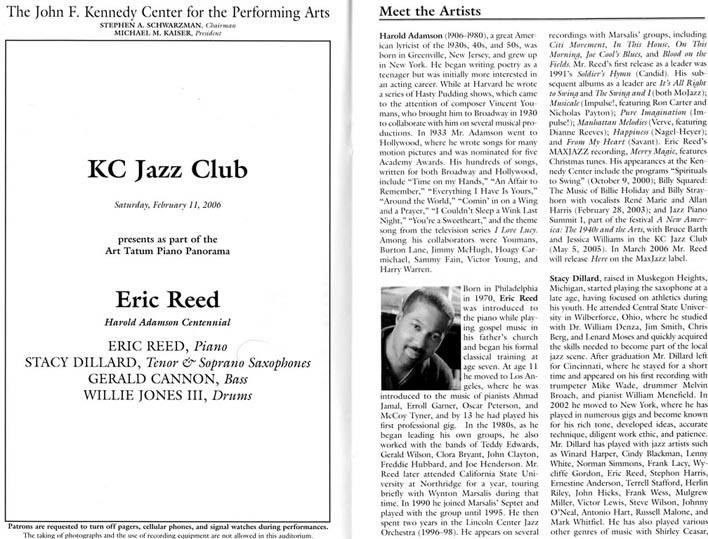 Eric Reed Program at Kennedy Center here. On December 10, 2006 Harold would have been 100 years old. Behind Every Great Man There is a Great Woman, Behind Harold Adamson was Gretchen. Please visit the memorial to my Aunt Gretchen Adamson, (Mrs. Harold Adamson), who died at 7:55pm August 2, 2002 here. 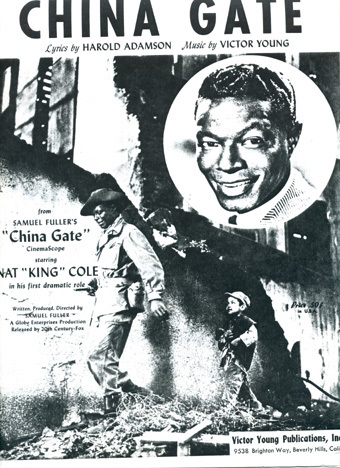 In the late 1950s Harold wrote a song China Gate for the film of the same n ame. In the film w as actress Angie Dickinson who had rummored to have been in a romantic relationship with future President John F. Kennedy. In 2002 I went with Mrs. Harold Adamson to the Academy to watch a private screening of a film. Gretchen had to go into the restroom with her wheel chair. When she came out she said "Bruce, I would like you to meet this kind lady who assisted me....Angie Dickinson." Instantly I recalled China Gate and while shaking Angie's hand that this could have been one of the 26 ladies who had been intimate with President Kennedy. Bruce Campbell Adamson produced both a 28 and 58 minute documentary "Our Pal Hal; An Affair To Remember". View the press release here.